Mike Dingman was a Captain of Industry who had a special place in his collecting heart for advertising signs – especially neon – and flathead Fords. He was the Chairman of Wheelabrator Frye, one of the most consequential conglomerates of the 1970’s which became Signal Group, later Chairman of Henley Group, another conglomerate spun out of Signal, and longtime director of the Ford Motor Company. 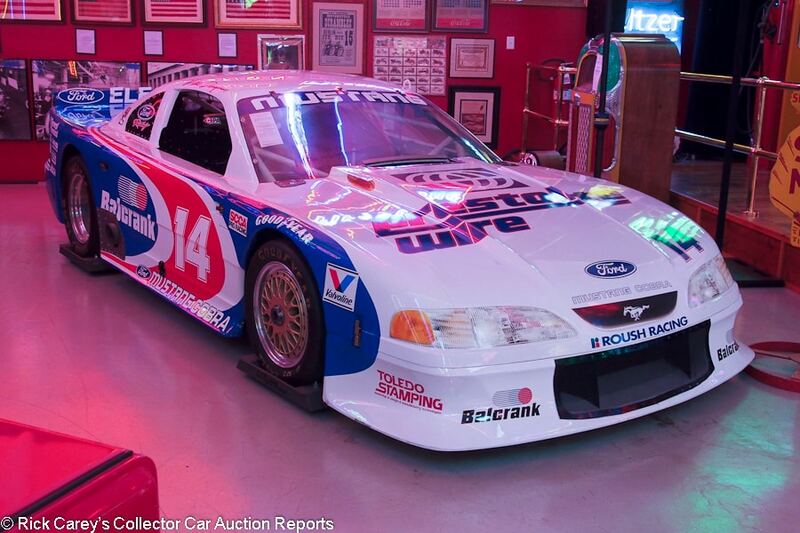 Mike beat cancer twice, but each time sold off his sign and Ford collection with RM, first in 2006 and again in 2012. Each time he entered remission he quickly rebuilt his collections. 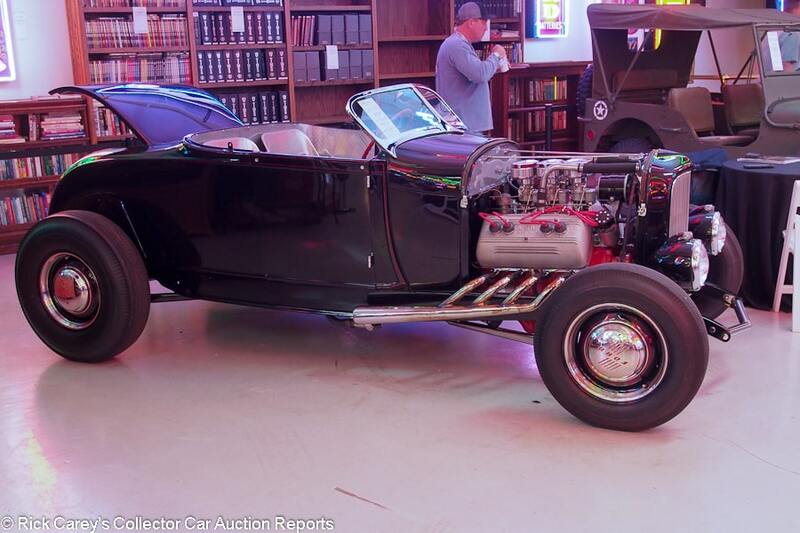 He didn’t beat cancer in 2017 and it was the final disposition of his collection, all offered without reserve, that RM presented the weekend of June 23-24, contiguous with Barrett-Jackson’s Northeast auction a 2½ hour drive away in Connecticut. Mike Dingman never stinted on quality. 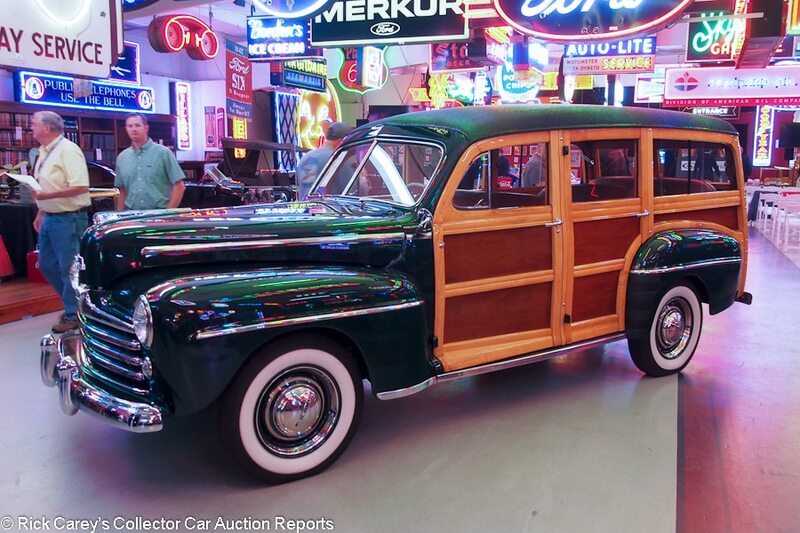 Every restoration, whether a gigantic neon sign or a flathead Ford woodie wagon, was done to the highest standards, standards recognized by collectors of such things. 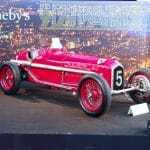 And while his final collection consisted of just eighteen vehicles RM assembled another nineteen similar Ford Motor Company vehicles to create a 37 vehicle docket. 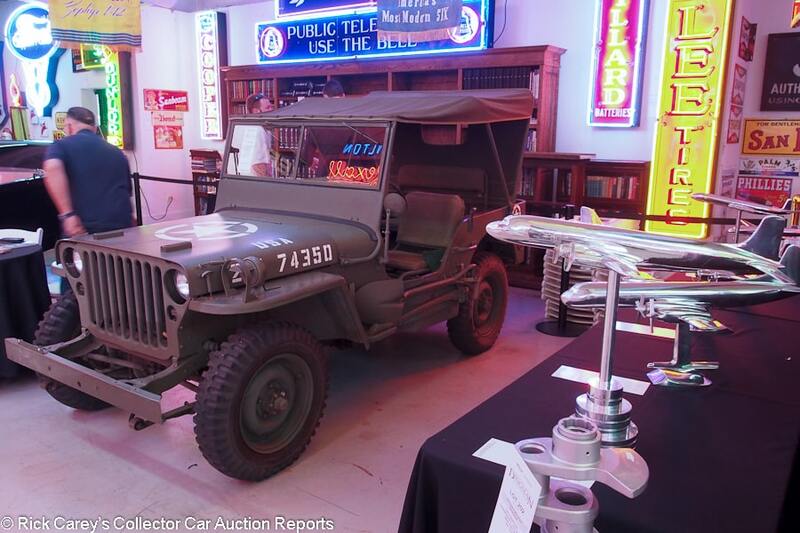 To the vehicles were added an astounding 703 lots of signs, memorabilia and even a 1940’s railroad car style diner, restored, functional and completely equipped. Many of the vehicles offered had Mike Dingman history including six in this collection which he bought back after the 2012 disposition. In all, nine of the 37 lots in the sale had been previously owned by, and in most cases restored for, Michael Dingman. There were several surprises in RM Auctions’ Dingman Collection sale. 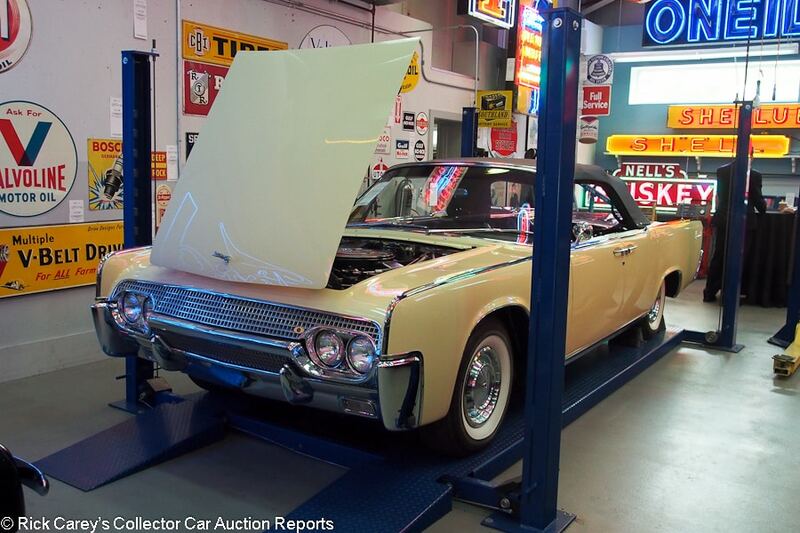 There were three energetic bidding contests: 1961 Lincoln Continental Convertible Sedan, 1985 Roush Mustang Trans Am (Mike drove a similar Roush Mustang to 5th place in the 1992 IMSA GTO series season championship) and 1950 Mercury Club Coupe. On the other hand there were three notable bargains: 1938 Ford Phaeton, 1939 Lincoln-Zephyr Convertible Sedan and 1939 Ford 5-window Coupe. Another five lots were good values. Eight lots out of the 30 viewed and written up (27%) selling modestly is surprising for a high-profile mostly single-owner auction. The signs, memorabilia and diner brought a total of $3,061,574 of which the diner contributed $336,000 including 12% commission. The signs lit up the auction space, giving a reflected neon glow to the photos of the cars displayed inside. The report that follows is sorted by Marque, Year, Model and Body Style. The Dingman Collection cars are noted in the descriptions. Lot # 937 1932 Ardun-Ford Model 18 High Boy Roadster ‘Blue Boy’; S/N 18165765; Dark Blue/Aluminum shell, Red leather cushions; No top; Estimate $80,000 – $100,000; Customized restoration, 2- condition; No Reserve; Hammered Sold at $61,071 plus commission of 12.00%; Final Price $68,400. – ’29 Model A Brookville steel body, veed Deuce radiator shell, Guide headlights with built-in parking lights, turn signals, steel wheels with trim rings and hubcaps, blackwall tires, ’38 Ford banjo spoke steering wheel, raked vee windshield with matching chrome front frame spreader. Flathead V-8, Ardun ohv heads, Austin 3-carb intake, Edwards air cleaners, Joe Hunt magneto, fuel cell, juice brakes, 1931 Chrysler instrument panel and gauges. – Very good paint, chrome and interior. Marvelous speed equipment. Not fresh but better than most of its counterparts. Recently rebuilt Ardun-Ford with new block, cam and lifters. – Sold by RM at Monterey from Jack Boxstrom’s collection in 2007 for $143,000, then sold back to Jack at Ft. Lauderdale in 2011 for $39,050 but with a stock flathead engine. Reunited with its Ardun, now rebuilt, this is a primo street rod and a very good value at this price, a car that couldn’t be replicated for twice this money. 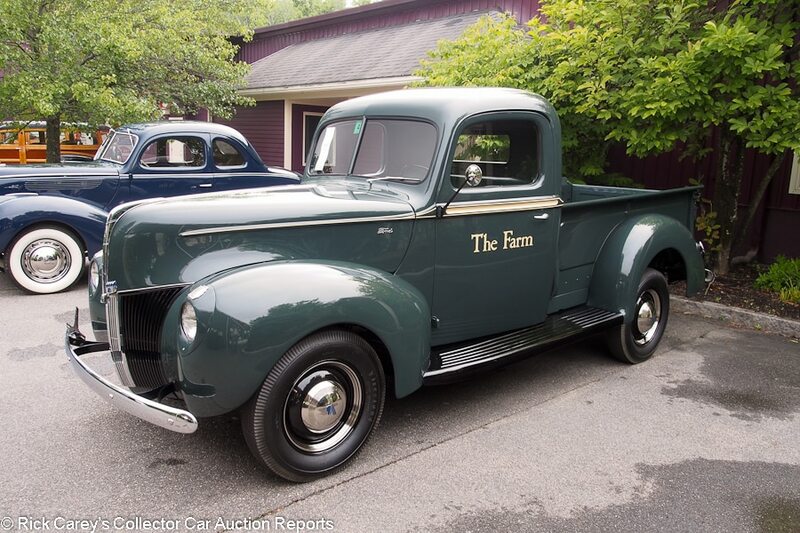 Lot # 913 1945 Dodge WC-58 4×4 Radio Car; S/N 81767122; Olive Drab/Brown leatherette; Olive Drab cloth top; Estimate $50,000 – $75,000; Visually maintained, largely original, 3- condition; No Reserve; Hammered Sold at $62,500 plus commission of 12.00%; Final Price $70,000. – 230/92hp six, 4-speed, winch, radio enclosure, shovel, axe, jerry can, radiator guard. – Drab, quickly applied paint, serviceable upholstery, old flappy top. Aged engine has been out and rebuilt to utilitarian standards. Fun to drive but old and used. Michael Dingman Collection. – About the best that can be said for this WC-58 is that it is complete and unusual. Why it is in Mike Dingman’s collection of Ford products (along with two Porsches) is a mystery. The price it brought is not a mystery, but it is generous. Lot # 927 1932 Ford Model B Station Wagon; S/N B5041968; Emperor Brown, Black fenders/Colonial Grain leatherette; Estimate $110,000 – $130,000; Older restoration, 2- condition; No Reserve; Hammered Sold at $65,000 plus commission of 12.00%; Final Price $72,800. – Chrome bumpers, three-row seating, tailgate, single sidemount, black wire wheels, blackwall tires, sliding side curtains. 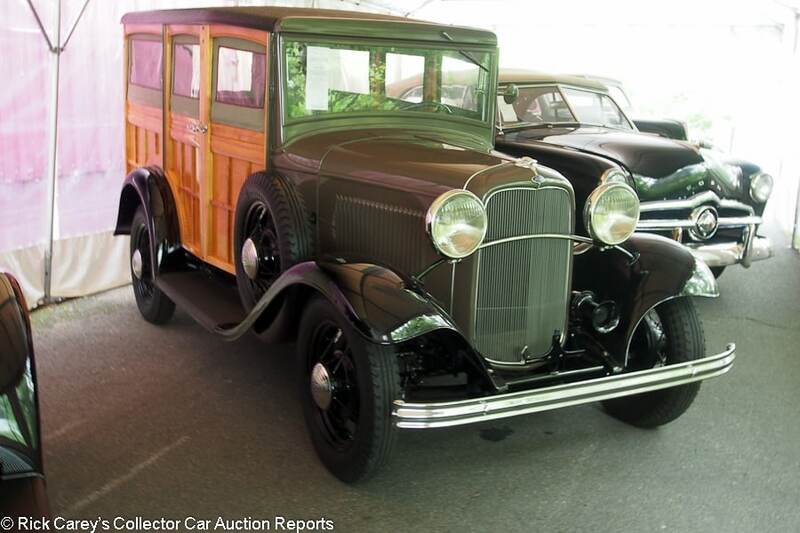 – One of the very rare ’32 Model B 4-cylinders, one of twenty Model B woodie wagons known. Restored like new in Nick Alexander’s shop with very good paint, chrome, interior and freshly varnished wood. Very nice and exceptionally well-preserved. 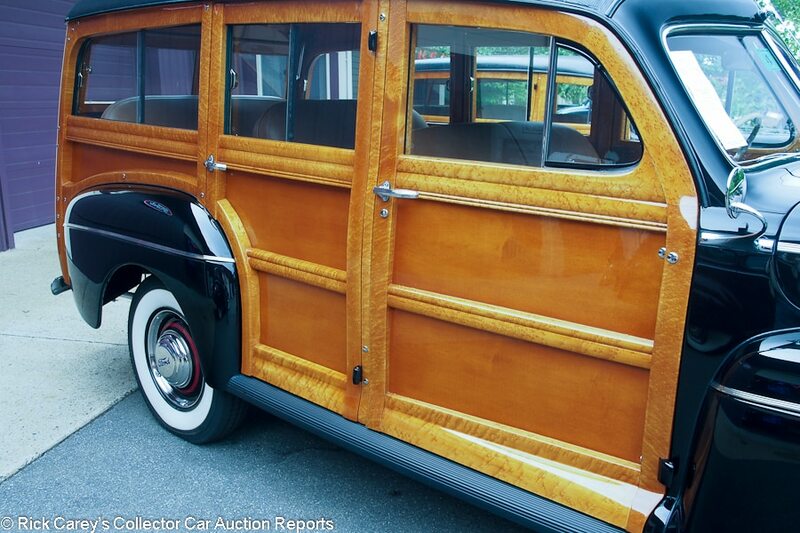 – Sold by RM at Hershey in 2011 for $99,000 and almost clinically maintained since in nearly impeccable condition, this is a rare Ford woodie bought for a modest price. Lot # 943 1933 Ford Model 40 DeLuxe Coupe 3-window; S/N 18521659; Coach Maroon, Black fenders, Vermilion coachline/Beige cloth; Estimate $70,000 – $90,000; Older restoration, 3+ condition; No Reserve; Hammered Sold at $49,000 plus commission of 12.00%; Final Price $54,880. – Aurora Red wire wheels, wide whitewalls, clock, metal covered rear-mounted spare, greyhound. – Good older paint, chrome and interior. Goob gauges sitting in blemished panels, good woodgraining. The engine is clean, orderly and showing age and use. The chassis was restored like new then driven and is a little oily and road grimy. Both doors have tiny edge chips and the window channels protrude. Restored 35 years ago by Lowrey and enjoyed but preserved. – Ford built 15,894 DeLuxe 3-window coupes and few that survive chopping and channeling will be in as good shape as this seriously old restoration. Its age is showing, though, and the bidders weren’t prepared to value it as highly as the pre-sale estimate suggested resulting in a good value for the new owner. 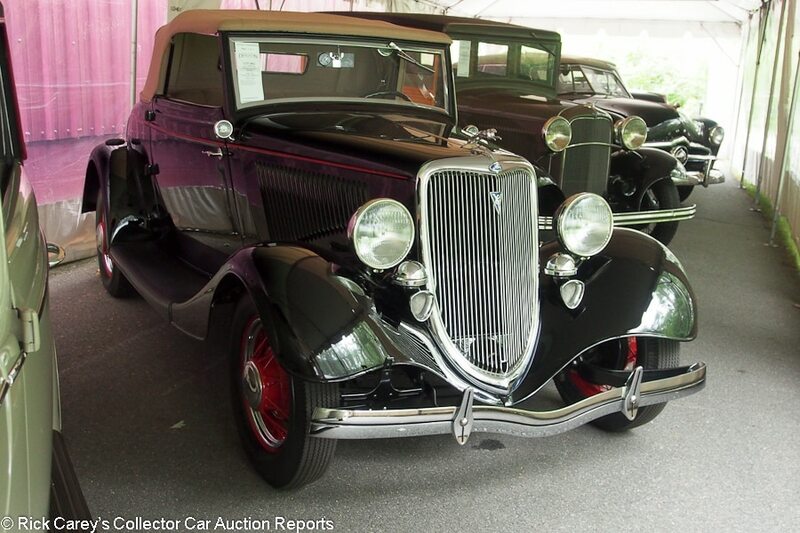 Lot # 942 1934 Ford Model 48 DeLuxe Cabriolet; S/N 18611393; Black/Beige broadcloth; Beige cloth top; Estimate $65,000 – $75,000; Concours restoration, 1- condition; No Reserve; Hammered Sold at $57,000 plus commission of 12.00%; Final Price $63,840. – Red wire wheels, blackwall tires, enclosed rear-mounted spare, rumble seat, dual taillights, radio, no heater. – Excellent paint, chrome, interior and top. The interior woodgrain sparkles. The engine compartment is a little dusty but could be nearly like new with some detailing. 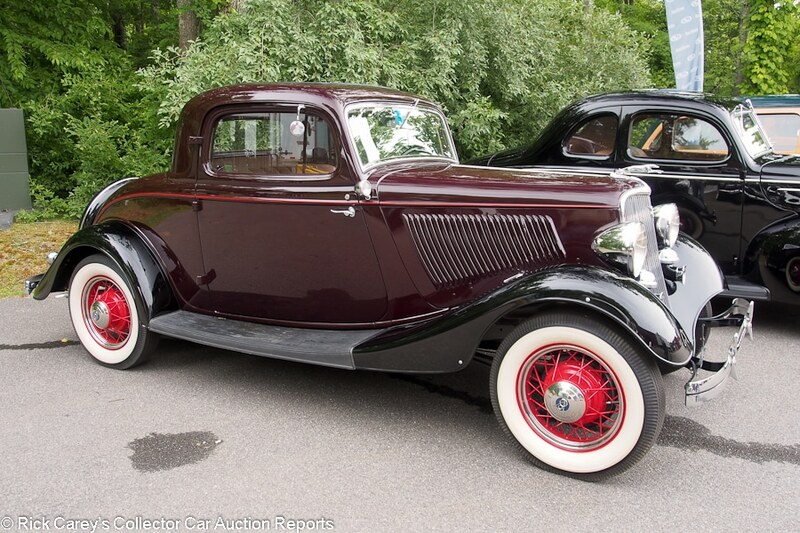 A way good example of a handsome and practical ’34 Ford. – Offered by RM in Ft. Lauderdale two months ago where it was reported bid to $50,000. It did a deserved bit better here but is still a sound value at the price. 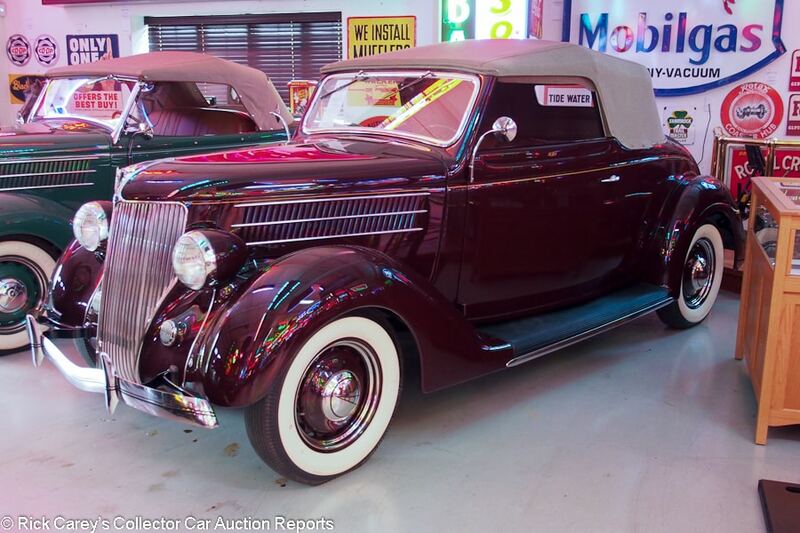 Lot # 928 1936 Ford Model 68 DeLuxe Cabriolet; S/N 183090500; Maroon; Estimate $70,000 – $90,000; Not evaluated; No Reserve; Hammered Sold at $65,000 plus commission of 12.00%; Final Price $72,800. – 1991 AACA Senior and Dearborn Award in 1991. – Sold by RM at Hershey in 2012 for $68,750. 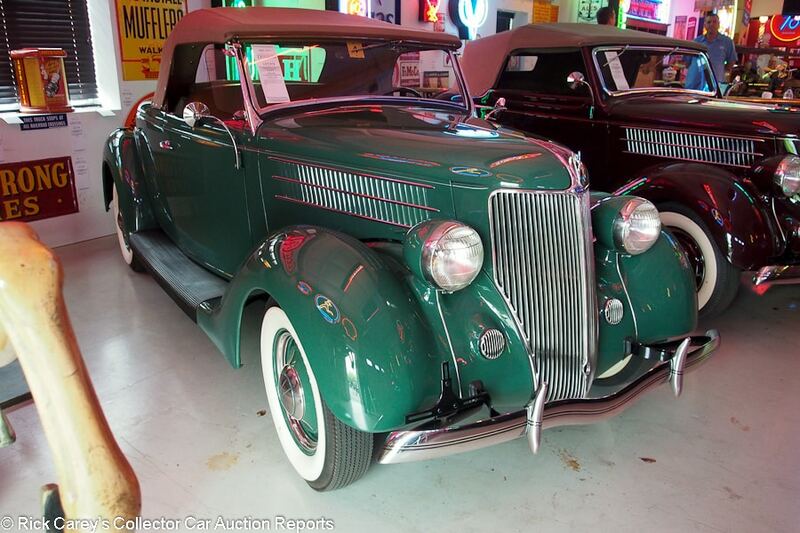 Lot # 919 1936 Ford Model 68 DeLuxe Roadster; S/N 183223752; Green; Saddle leather top; Estimate $75,000 – $100,000; Not evaluated; No Reserve; Hammered Sold at $125,000 plus commission of 12.00%; Final Price $140,000. – Michael Dingman Collection. – Sold at RM’s 2012 Dingman auction for $181,500. Lot # 926 1938 Ford Model 81A DeLuxe Coupe; S/N 4262856; Washington Blue/Saddle leather; Estimate $65,000 – $85,000; Older restoration, 2- condition; No Reserve; Hammered Sold at $45,000 plus commission of 12.00%; Final Price $50,400. – Banjo spoke steering wheel, heater, hubcaps, trim rings, chrome wheel spiders, trim rings, bumper overriders, wide double-side whitewalls, opening windshield. – Excellent paint and chrome. The upholstery is very good but has stretch creases radiating from the buttons. Excellent gauges are interior woodgraining. Flat panels and even gaps. The engine compartment and chassis are better than new although the gold painted carburetor is jarring. AACA Ford and Dearborn Award winner in the late 90’s. – Sold by RM at Amelia in 2011 for $60,500 when it had 29 fewer miles on its odometer and was essentially as offered today. The 2011 result was strong, today’s is realistic. 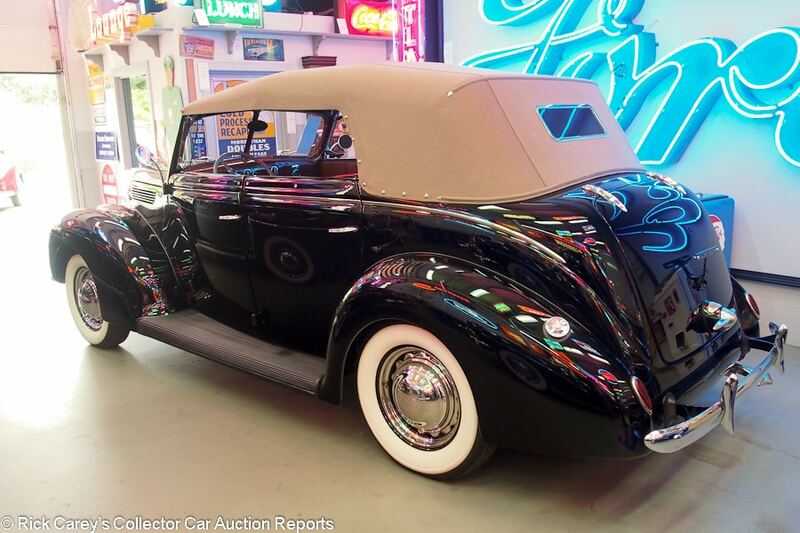 Lot # 920 1938 Ford Model 81A DeLuxe Phaeton; S/N 184371605; Black/Tan leather; Heather cloth top; Estimate $75,000 – $125,000; Older restoration, 2+ condition; No Reserve; Hammered Sold at $55,000 plus commission of 12.00%; Final Price $61,600. – Hubcaps and trim rings, chrome wheel spiders, wide whitewalls, wind wings, banjo spoke steering wheel, clock, Ford script tires. – Excellent paint, chrome, interior, top and glass. The engine compartment and chassis are better than new but not overdone. 1938 was the last year for Ford’s phaeton body style and only 1,169 were built. Michael Dingman Collection. 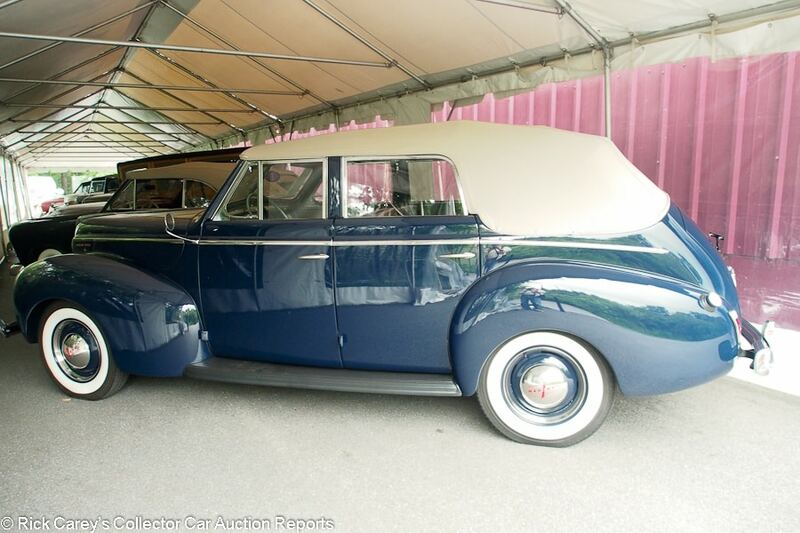 – Sold at RM’s 2012 Dingman auction for $104,500, this is a remarkable value that begs the question, ‘In a room full of Ford buyers why didn’t this rare bodied car in impeccable condition bring more?’ Maybe it is because the trunk-back body is a little chunky. 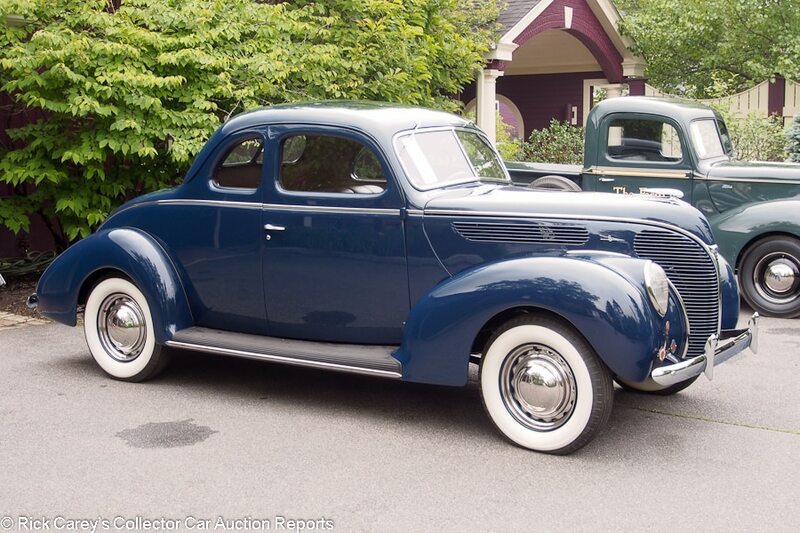 Maybe it is because 1938 isn’t one of the most attractive prewar Ford designs. But whatever the reason, the new owner of this car has an outstanding value. Lot # 921 1938 Ford Model 81A DeLuxe Station Wagon; S/N 184266903; Washington Blue/Saddle vinyl; Estimate $80,000 – $160,000; Older restoration, 2- condition; No Reserve; Hammered Sold at $70,000 plus commission of 12.00%; Final Price $78,400. – Banjo spoke steering wheel, radio, clock, hot air heater, dual taillights, 12 volt, Eclipse CD changer in the glove box, Sirius XM receiver, juice brakes, 3-row seating, hubcaps, trim rings, chrome wheel spiders, wide double-side whitewalls, Roush-built flathead. – Very good older paint, chrome, interior and exterior wood with three pieces of tiger maple framing including one gorgeous post on the left rear door. The instruments are aged. The underbody and engine compartment are impeccable without being turned into jewelry, with some modern hoses and wiring. 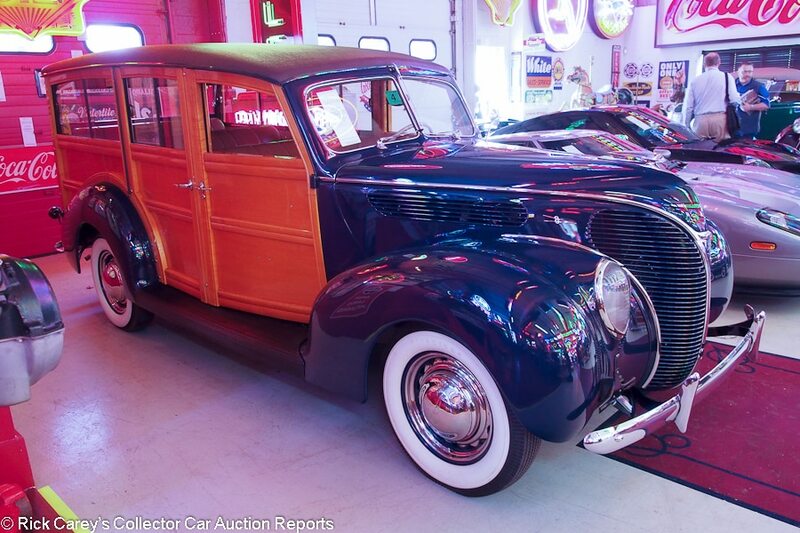 A wonderful ’38 Ford woodie for weekend drives. Michael Dingman Collection. – Sold by RM at the 2012 Dingman sale for an eye-popping $209,000, then bought back by Mike Dingman and bought here for a moderate but appropriate price. Lot # 936 1939 Ford Model 91A DeLuxe Convertible Coupe; S/N 185144144; Folkstone Grey/Brown leather; Black cloth top; Estimate $100,000 – $125,000; Not evaluated; No Reserve; Hammered Sold at $80,000 plus commission of 12.00%; Final Price $89,600. – Sold at Mecum’s Dallas auction last September for $74,250. 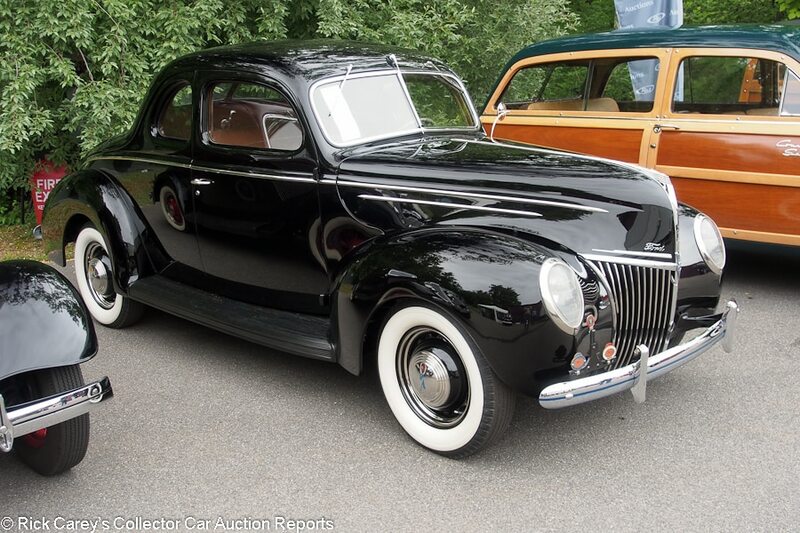 Lot # 935 1939 Ford Model 91A DeLuxe Coupe 5-window; S/N 185090793; Black/Saddle leather; Estimate $85,000 – $115,000; Older restoration, 2+ condition; No Reserve; Hammered Sold at $44,000 plus commission of 12.00%; Final Price $49,280. – Columbia 2-speed axle, radio, no heater, banjo spoke steering wheel, clock, hubcaps, trim rings, Ford script tires – Excellent paint, chrome, interior, gauges and woodgraining. The engine compartment and chassis are spotless aside from a little fuel residue on the carburetor. Freshly detailed. 2001 AACA Grand National Senior Award and Dearborn Award winner and looks like it. – Sold by RM at St. John’s in 2013 for $78,100 and bought here at a bargain price barely half the low estimate. Lot # 940 1939 Ford Model 91A DeLuxe Station Wagon; S/N 184801771; Black/Brown leatherette; Estimate $80,000 – $100,000; Cosmetic restoration, 3- condition; No Reserve; Hammered Sold at $43,000 plus commission of 12.00%; Final Price $48,160. – Radio, heater, banjo spoke steering wheel, clock, 3-row seating, Red wheels with hubcaps and trim rings. – Chipguarded nose, sound, usable paint with some dirt flecks and a scrape or three. Sound original wood with some water damage at joints and in desperate need of sanding and new varnish. Badly deteriorated running board covers. Sound upholstery. Fair gauges with rusty bezels. Worn steering wheel rim. A sound and utilitarian woody in need of attention soon. – Sold by RM in Arizona in 2016 for $93,500, a generous result even for a highly original car boasting an abundance of patina. The bidders here were reluctant to put great value on the patina and bought it for weekend beach trip woodie money, a good value with plenty of upside potential, a car that can be (after the wood is protected with a good coat of varnish) driven and enjoyed by a family with wet dogs without much concern. Lot # 944 1940 Ford Model 01A DeLuxe Fordor Sedan; S/N 185687766; Garnet Maroon/Brown leather; Estimate $60,000 – $80,000; Older restoration, 2- condition; No Reserve; Hammered Sold at $47,500 plus commission of 12.00%; Final Price $53,200. – Radio, clock, no heater, skirts, hubcaps, trim rings, wide whitewalls, bumper tips, grille and trunk guards. – 1989 AACA Senior Award and Dearborn Award winner for Benny ‘Mr. Ford’ Bootle. Very good paint, chrome and interior. The engine compartment is orderly but showing age particularly down on the frame and with fuel staining on the carburetor. A seriously impressive Fordor that looks much more fresh than its 1987 restoration would suggest. – This Fordor makes a plausible argument for fresh cosmetics after its late-80’s Benny Bootle restoration but that is not the case. 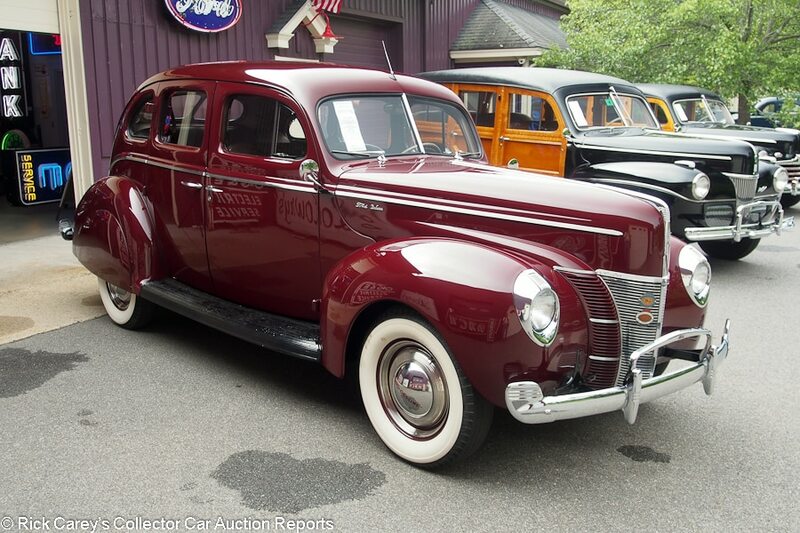 The bidders recognized its quality and preservation with a price more appropriate for a more sporting ’40 Ford than this stylish but still mainstream bodied Fordor. It is a piece of unusually high quality Ford history. Lot # 934 1940 Ford Model 01A DeLuxe Station Wagon; S/N 99A240265; Black/Brown leather; Estimate $100,000 – $140,000; Cosmetic restoration, 3- condition; No Reserve; Hammered Sold at $75,000 plus commission of 12.00%; Final Price $84,000. – 239/95hp, 3-speed, column shift, radio, heater, clock, hubcaps and trim rings, whitewalls, fog lights, 3-row seating, enclosed rear spare, dual blue dot taillights. – One of 354 delivered new with the 95hp engine. New tires. Sound but uninspired paint. Waterstained wood is sound and well varnished but not appealing at least next to Mike Dingman’s woodies. The right rear door is badly bowed. Old undercoat in the wheel wells. Cosmetically restored to mediocre standards. – Sold by Russo and Steele at Monterey in 2006 for $96,250, by Gooding at Pebble Beach in 2007 for a generous $132,000 and by Gooding at Scottsdale in 2011 for $82,500. The result here reflects the restoration’s age. Lot # 911 1940 Ford Model 01C Pickup; S/N 1B4402; Acadia Green, Yellow accent/Green leatherette; Estimate $50,000 – $75,000; Recent restoration, 2+ condition; No Reserve; Hammered Sold at $72,000 plus commission of 12.00%; Final Price $80,640. – Black wheels, hubcaps and trim rings, chrome bumpers, dual taillights, right running board mounted spare, engine oil filter. – Excellent paint, interior and chrome. There is one tiny chip on the back of the driver’s door behind the accent and the instrument faces are somewhat aged but those are the only noticeable flaws. Even the wood bed spacers are varnished. Described as restored in the last century, but looks like it was done last month. Michael Dingman Collection. – The doors were lettered ‘The Farm’ and one wag noted that the new owner could be said to have ‘Bought The Farm’. That didn’t seem to deter the bidders who paid a handsome price for a handsome truck but the underbidder will look a long time before finding a similar one from this period just before the war. The wood on this Wagon is so spectacular it deserves a more detailed photograph. 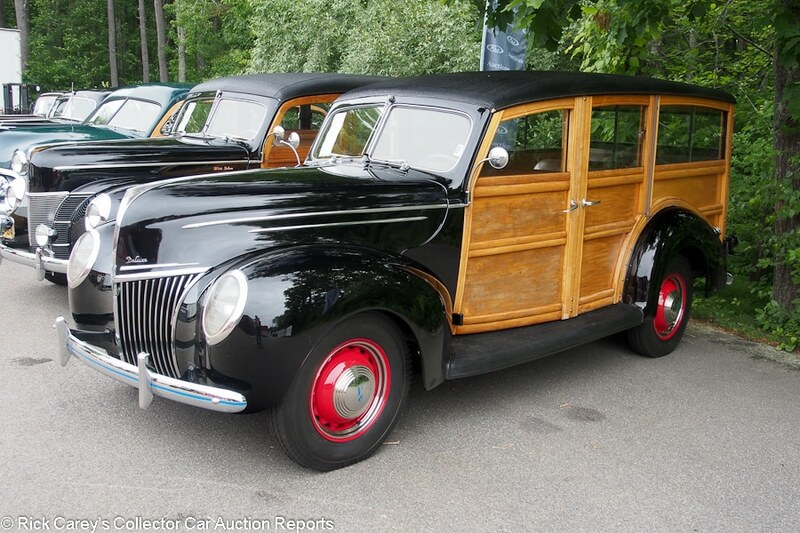 Lot # 915 1941 Ford Super DeLuxe Station Wagon; S/N 186472555; Black/Beige vinyl; Estimate $60,000 – $90,000; Older restoration, 2+ condition; No Reserve; Hammered Sold at $77,500 plus commission of 12.00%; Final Price $86,800. – Clock, radio, heater, 3-row seating, dual taillights, hubcaps and trim rings, wide whitewalls, enclosed rear spare. – Excellent paint, chrome and interior. The engine compartment and chassis are like new. Every splinter of the framing on the new body built by Mike Nickels is birdseye maple, some of it nothing less than spectacular in its depth and detail. It is as close to perfect as possible without being overdone. Michael Dingman Collection. 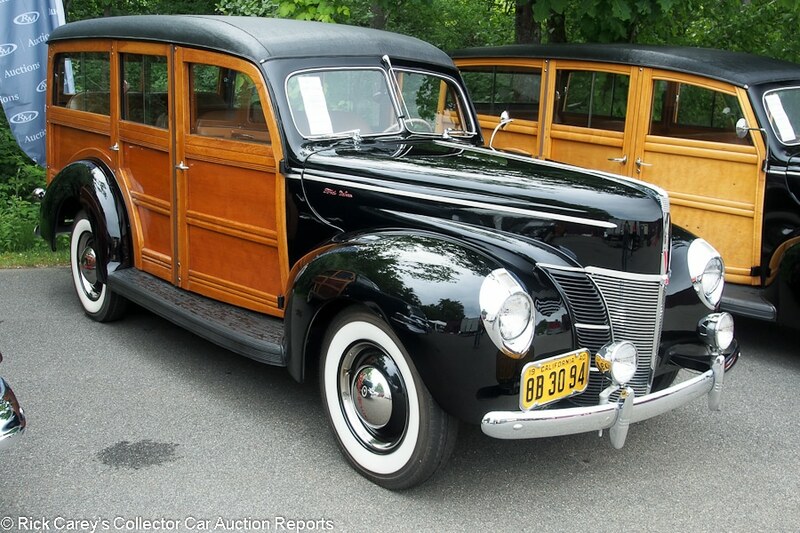 – This was the first of several Ford woodie wagons in this sale and it set a standard for both quality and price. The new body may have detracted from the latter, but what the new owner got was as good as it gets and a sound value. 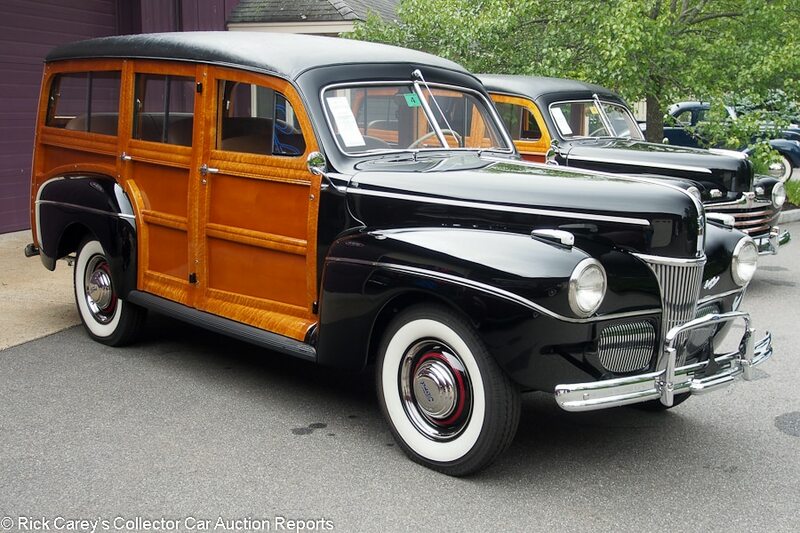 Lot # 939 1942 Ford Super DeLuxe Station Wagon; S/N 186873515; Black/Beige leather, vinyl; Estimate $90,000 – $110,000; Older restoration, 2+ condition; No Reserve; Hammered Sold at $105,000 plus commission of 12.00%; Final Price $117,600. 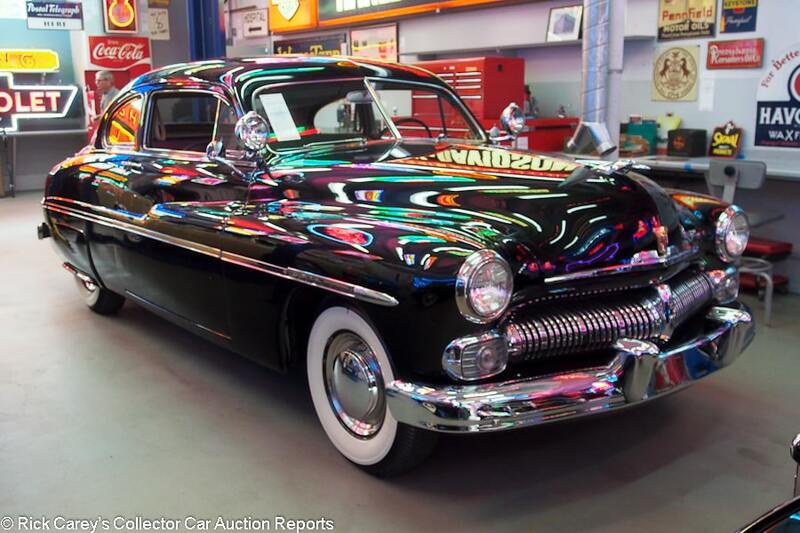 – Clock, heater, 3-row seating, hubcaps, trim rings, wide whitewalls, enclosed rear spare. – Excellent paint, chrome and interior. Excellent original wood with a little waterstaining at some joints and fasteners. The underbody and chassis are as good as the outside. Impeccable. 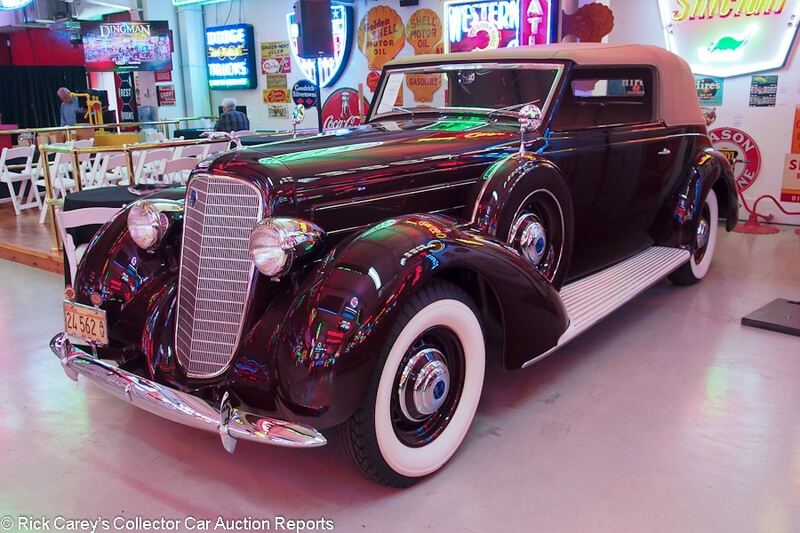 – Sold by RM at the 2012 Dingman sale for $176,000 and a sound value here for one of the rare ’42s. 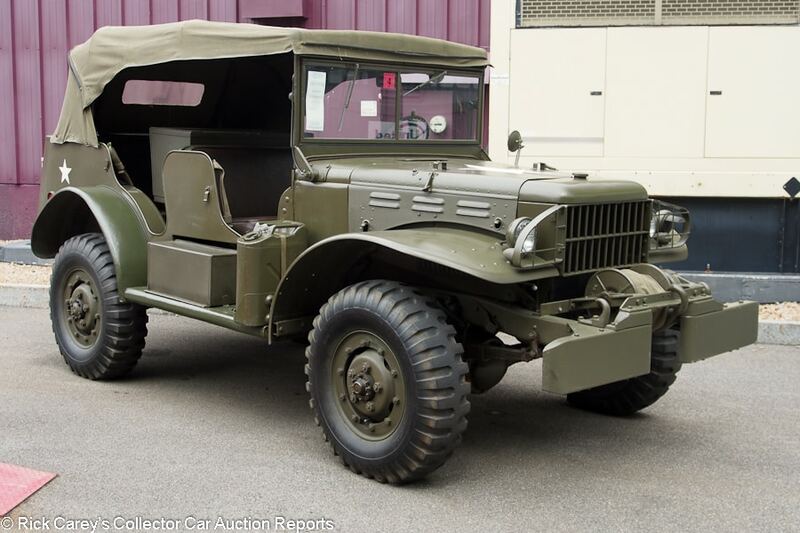 Lot # 908 1943 Ford GPW Jeep Utility; S/N GPW95105; Olive Drab/Olive Drab cloth; Olive Drab cloth top; Estimate $20,000 – $30,000; Visually maintained, largely original, 3- condition; No Reserve; Hammered Sold at $38,000 plus commission of 12.00%; Final Price $42,560. – Shovel, axe, rear seat, jerry can, metal carbine scabbard, 12 volt, alternator, blackout light. – Usable but aged, one of 277,896 built by Ford, which is why it was in Mike Dingman’s collection. Michael Dingman Collection. – The mid-point in the pre-sale estimate range would have been enough to pay for this complete but mediocre GPW. The final price is generous, reflecting its Mike Dingman provenance. It was the first vehicle across the block and an auspicious omen for the transactions to come. 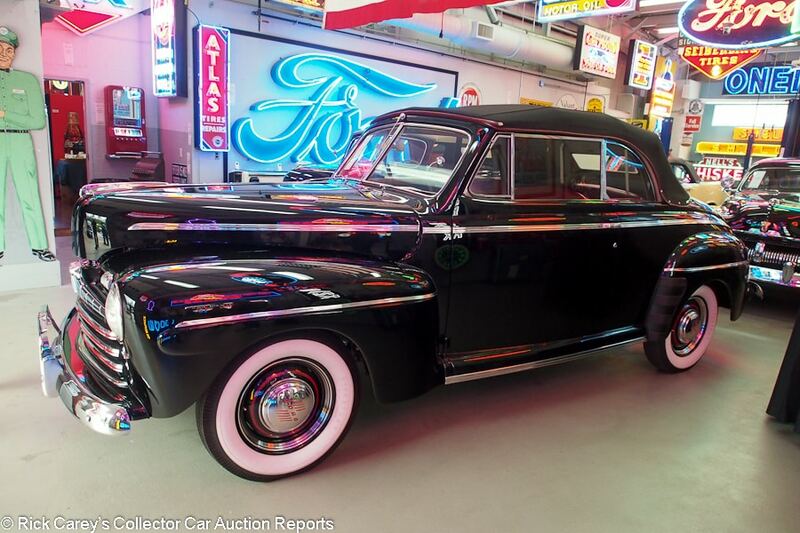 Lot # 917 1946 Ford Super DeLuxe Convertible; S/N 99A1224379; Black/Red vinyl, Beige cloth; Black cloth top; Estimate $60,000 – $90,000; Older restoration, 2+ condition; No Reserve; Hammered Sold at $74,000 plus commission of 12.00%; Final Price $82,880. – Columbia overdrive, 3-speed, radio, heater, clock, hubcaps and trim rings, wide whitewalls, oil filter, power top. – I’m getting tired of writing ‘Excellent paint, chrome, interior, glass and top’, but that’s the refrain with Mike Dingman’s cars. This car is flawless. Michael Dingman Collection. – How good is this ’46 Ford? It is so good that Mike Dingman sold it in RM’s 2012 auction of the collection, then bought it back. It brought $93,500 then and is a sound value at this price in today’s collector car market. 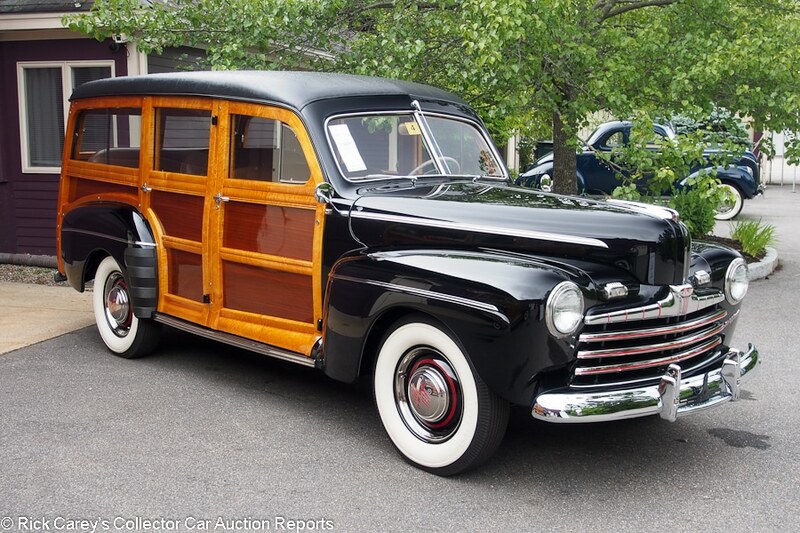 Lot # 918 1946 Ford Super DeLuxe Station Wagon; S/N 99A1172184; Black/Saddle vinyl; Estimate $60,000 – $90,000; Concours restoration, 1 condition; No Reserve; Hammered Sold at $110,000 plus commission of 12.00%; Final Price $123,200. – Radio, clock, hubcaps, trim rings, wide whitewalls, no heater, enclosed rear spare, 3-row seating, dual outside mirrors. – Excellent paint, chrome and interior. The exterior wood framing is 90% birdseye maple, some of it gloriously figured. All the wood panels fit perfectly. 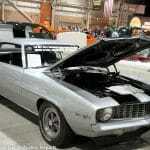 The engine compartment and chassis are better than new but not overrestored. A real showpiece, and the ’46-’47 red accents on the chrome are delicious. Michael Dingman Collection. – Restored by Jim Lowrey for Mike Dingman in 2011, then sold in RM’s 2012 Dingman sale for $132,000 and reacquired in 2014. Its quality is such that it wasn’t expensive then, and it isn’t now, despite the estimate range. 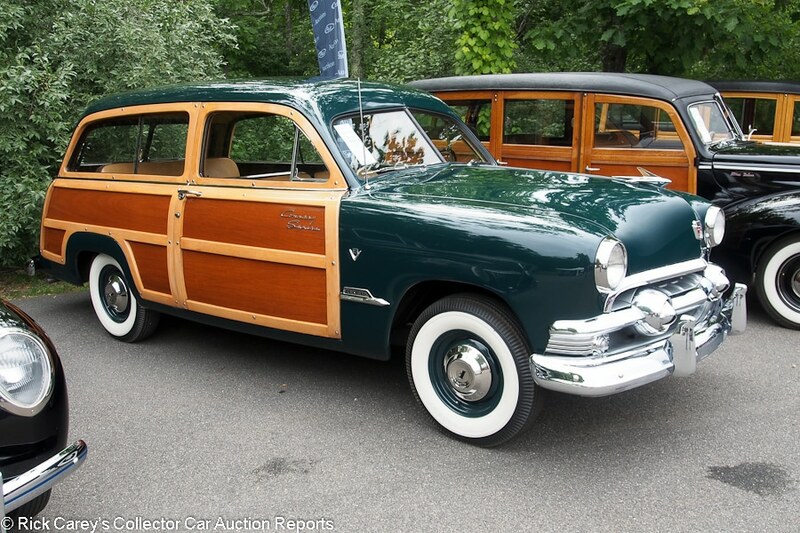 Lot # 922 1947 Ford Super DeLuxe Station Wagon; S/N 799A2004772; Glade Green/Saddle leather; Estimate $80,000 – $120,000; Older restoration, 2+ condition; No Reserve; Hammered Sold at $130,000 plus commission of 12.00%; Final Price $145,600. – Radio, heater, clock, hubcaps, trim rings, whitewalls, 3-row seating, bumper overriders, enclosed rear spare, Roush-built flathead. – One of the updated ‘Spring Model’ 1947 Fords. Excellent paint, chrome and interior. The mostly original wood framing is nearly impeccable aside from a few water stains at joints and fasteners. The underbody, chassis and engine compartment are like new. 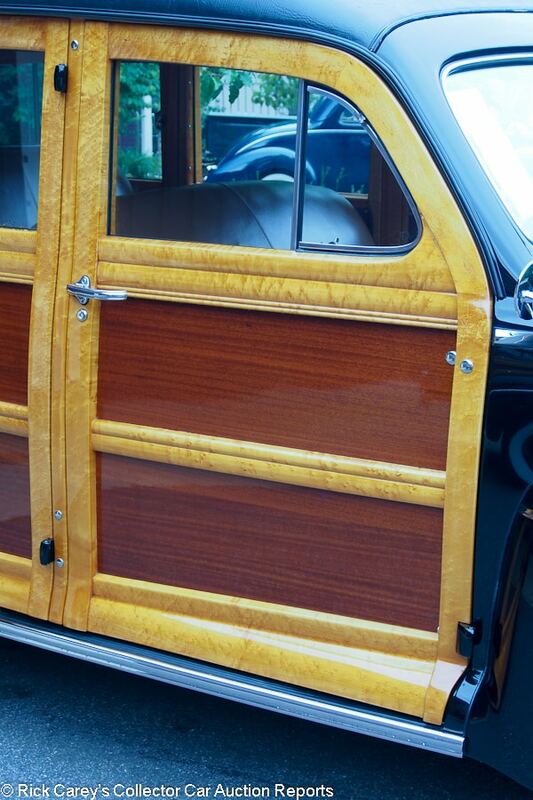 An older restoration updated by Ford woodie specialists since it was completed and better than new. Michael Dingman Collection. – Sold by RM at the 2012 Dingman Collection auction and subsequently re-acquired, the quality of the older restoration and its diligent upkeep resulted in a superior price which it deserved. 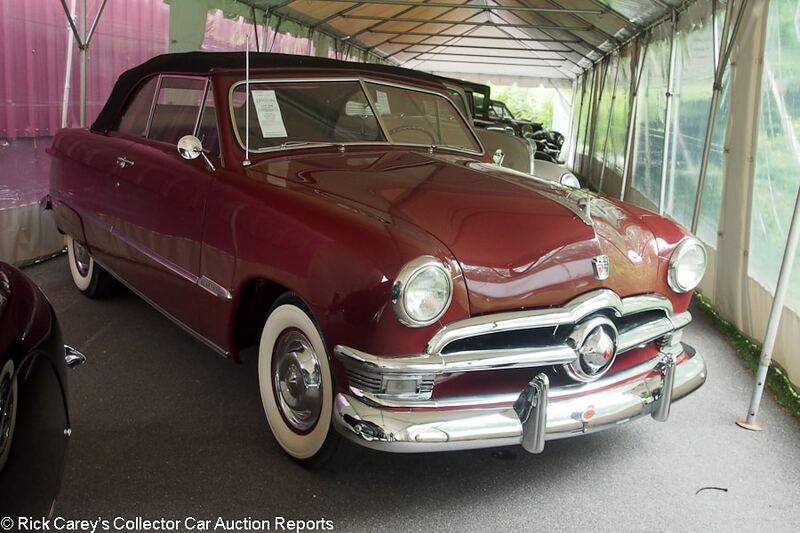 Lot # 929 1949 Ford Custom Convertible; S/N 98BA156903; Black/Brown leather; Tan cloth top; Estimate $110,000 – $140,000; Not evaluated; No Reserve; Hammered Sold at $90,000 plus commission of 12.00%; Final Price $100,800. – Pushbutton radio, power top, clock, heater. – Sold at RM’s Dingman Collection auction in 2012 for $99,000. 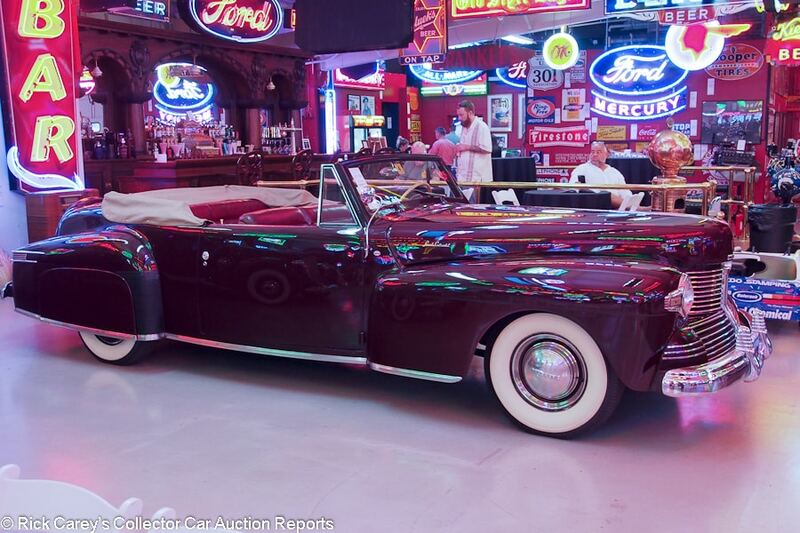 Lot # 938 1950 Ford Custom DeLuxe Convertible; S/N B0LB112069; Cambridge Maroon/Black, Red vinyl; Black cloth top; Estimate $60,000 – $80,000; Not evaluated; No Reserve; Hammered Sold at $52,500 plus commission of 12.00%; Final Price $58,800. – AACA Senior. Lot # 933 1951 Ford Custom Country Squire 2-Dr. Station Wagon; S/N 0479H5153739; Hawthorne Green/Brown leatherette, Beige vinyl; Estimate $100,000 – $120,000; Older restoration, 2- condition; No Reserve; Hammered Sold at $65,000 plus commission of 12.00%; Final Price $72,800. – 3-speed, heater, pushbutton radio, clock, 3-row seating, hubcaps, wide whitewalls, rear-mounted spare. – Represented as 29,901 miles from new and a Dearborn Award winner in 1977. Very good paint. Oddly satin-finished grille bar and bullets but otherwise very good chrome. Badly faded and blotchy light wood framing with some small cracks and incipient water damage. Good panels. Good dash and gauges. Sound original upholstery. The engine compartment is like new. The frame and underbody have factory undercoat but then have been haphazardly squirted black more recently. The preservation of the restoration is remarkable but the passage of time, even with the most meticulous care, is making its presence known. 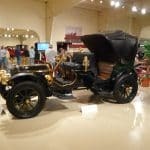 – This should have brought at least another $10,000, even if not the rather generous pre-sale estimate, and is a solid value for its condition, originality and preservation. The VIN is strange, but it’s Canadian-delivery and the ‘0479’ prefix may reflect some regional numbering practice. ’79’ is the body style number. 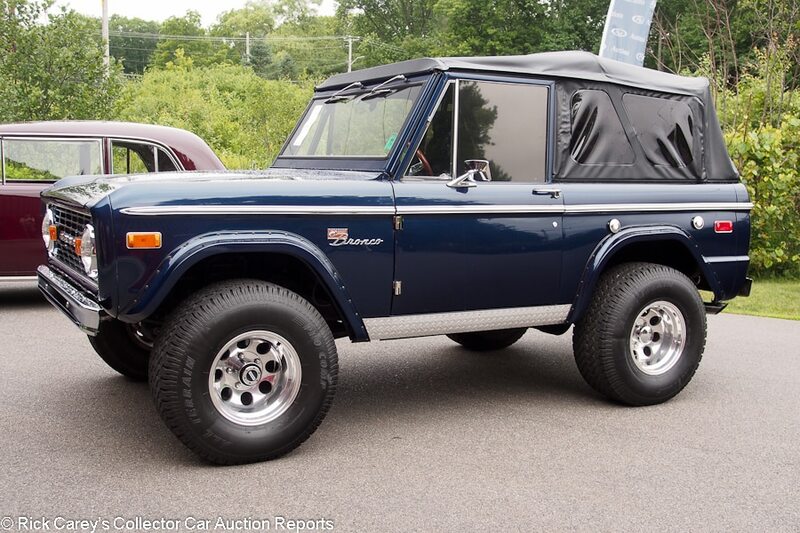 Lot # 914 1975 Ford Bronco Utility Custom; S/N U15GLV20032; Dark Blue/Dark Grey cloth; Black leatherette top; Estimate $40,000 – $70,000; Customized restoration, 3- condition; No Reserve; Hammered Sold at $60,000 plus commission of 12.00%; Final Price $67,200. – 302, Edelbrock heads, 4-barrel, MSD ignition, fender flares, chrome bumpers, Warn front hubs, alloy wheels, 33×12.5 tires, cassette stereo, heater, custom billet steering column, canvas covered seats, Hurst shifter, digital gauges, woodrim steering wheel, cassette stereo, full rollcage, diamond plate exterior and interior trim. – Serviceable repaint with offroading scratches. Original, dirty chassis and underbody. A practical woods and field runner. Michael Dingman Collection. – Broncos are the coming trend and selective customization can add to value but this is at the head of the class when it comes to prices, a well-used Bronco that anywhere else would have been fully priced at $30,000. Lot # 924 1995 Ford Roush Mustang Trans Am Coupe; S/N 32; White, Blue ‘Balcrank’/Black cloth; Estimate $300,000 – $400,000; Competition car, original as-raced, 2+ condition; No Reserve; Hammered Sold at $650,000 plus commission of 10.77%; Final Price $720,000. – 310cid Roush engine, 5-speed, tube frame, centerlock wheels, Alcon brakes – Clean, orderly as-raced condition with storage cobwebs indicate it hasn’t run since bought from Roush. Good cosmetics in Mike Dingman’s livery, but this is Tom Kendall’s 1996 Trans Am championship winning chassis and drivetrain. Michael Dingman Collection. – In his 60’s empire builder Michael Dingman took up auto racing in Roush-built cars in SCCA Trans Am, one of the most competitive classes of the day, and IMSA GTO, always in Ford-branded cars. He finished 5th in the 1992 IMSA GTO series. When Jack Roush sold off his old Mustang race cars Dingman missed out on acquiring one of the cars he drove, but his consolation prize was this ex-Tom Kendall Trans Am championship-winning car. It excited the bidding contest of the day and after nearly stalling out below $300K took off between two bidders in the room (one rumored to be representing Tommy Kendall) to this substantially astounding result. It’s an epic car, but this is an epic price for it. 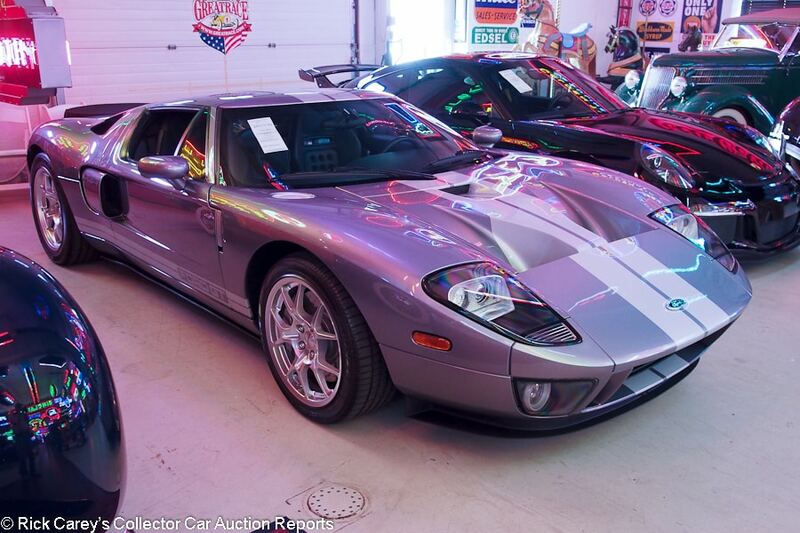 Lot # 932 2006 Ford GT Coupe; S/N 1FAFP90S46Y400378; Tungsten Grey, Silver stripes/Black leather; Estimate $300,000 – $350,000; Unrestored original, 2 condition; No Reserve; Hammered Sold at $270,000 plus commission of 11.85%; Final Price $302,000. – Four options. – 2,400 miles, one owner. Lightly creased driver’s seat cushion. – An appropriate result even for a GT that has this many miles on it. Lot # 930 1937 Lincoln Model K Convertible Victoria, Body by Brunn & Co.; S/N K8357; Sears Maroon/Beige leather; Beige cloth top; Estimate $125,000 – $150,000; Concours restoration, 1- condition; No Reserve; Hammered Sold at $165,000 plus commission of 12.00%; Final Price $184,800. – Dual enclosed sidemounts with mirrors, wide hubcaps, wide whitewalls, white running board covers, 1936-style grille, fenders and free-standing chrome headlights. – Bought and specified by Eleanora Randolph Sears, restored in the 90’s for Dr. Barbara Atwood. Excellent paint, chrome, interior and top. The engine compartment, chassis and underbody were restored to better than new condition and have been maintained consistently to judge from the grease around and under the suspension joints. The chassis is a little dusty but is straightforward to clean up to show quality presentation. 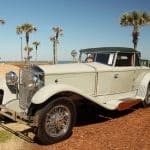 – Sold by RM in Arizona in 2009 for $126,500, a restoration that itself qualifies as an ‘antique’ but is still exceptional and with a rare provenance. 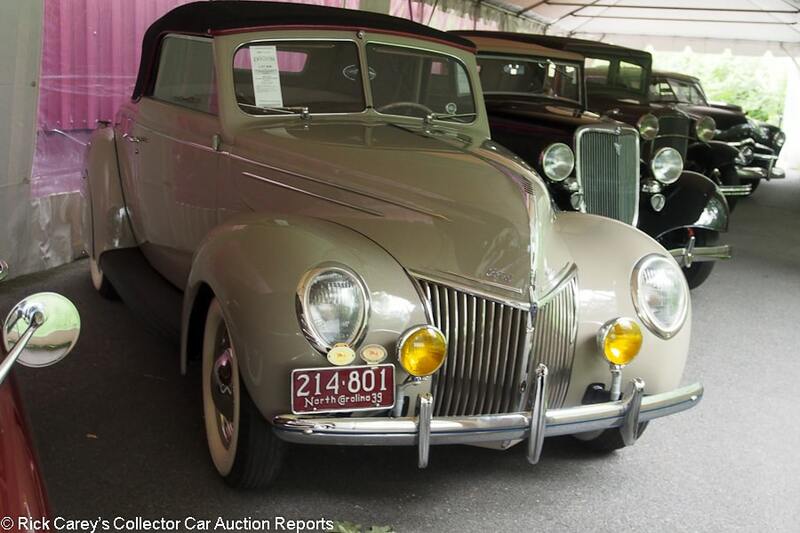 This is a classic car with a marvelous history and it brought a ringing endorsement from the bidders at this sale. Lot # 916 1942 Lincoln Continental Cabriolet; S/N 132054; Victoria Coach Maroon/Red leather; Beige cloth top; Estimate $60,000 – $90,000; Cosmetic restoration, 3 condition; No Reserve; Hammered Sold at $54,000 plus commission of 12.00%; Final Price $60,480. – Skirts, wide hubcaps and whitewalls, heater, radio, overdrive, asymmetric outside mirrors. – One of only 136 built before production ended in February 1942. Very good older paint but with poor masking on the vent window seals. Sound older upholstery with a major rub on the piping between the front seats. Old undercoat in the wheel wells. 1971 CCCA National First Prize #513, but won’t repeat that today and is in touring condition. Michael Dingman Collection. – One of very few Ford vehicles in Mike Dingman’s collection that is less than spectacular but the quality of the restoration is endorsed by its survival this well for almost half a century. This is a realistic price for it. 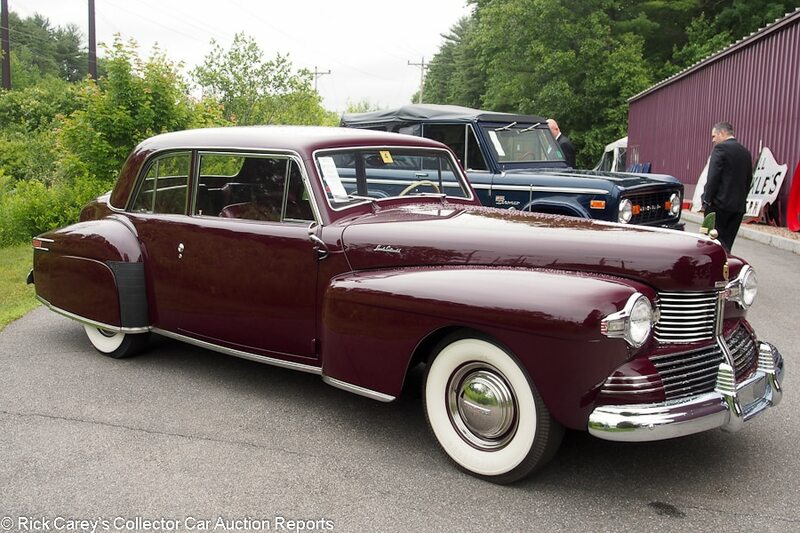 Lot # 910 1942 Lincoln Continental Club Coupe; S/N H135028; Victoria Coach Maroon/Red leather; Estimate $25,000 – $45,000; Not evaluated; No Reserve; Hammered Sold at $37,000 plus commission of 12.00%; Final Price $41,440. – Michael Dingman Collection. Lot # 909 1961 Lincoln Continental Convertible Sedan; S/N 1Y86H414255; Sunburst Yellow/Black leather; Black vinyl top; Estimate $40,000 – $60,000; Recent restoration, 2+ condition; No Reserve; Hammered Sold at $92,500 plus commission of 12.00%; Final Price $103,600. – Air conditioning and everything else. – Superb paint, interior, chrome, top and glass. The engine compartment and chassis are as close to flawless as they need to be. This may not be the best Continental Convertible Sedan in the world, but if it isn’t it’s so close that it doesn’t make a lot of difference, and the color is both unusual and eye-catching. Michael Dingman Collection. – It takes a magnificent Continental Convertible Sedan to be worth six figures and only a very few have breached that benchmark. This one deserved to join that exclusive club, but even then it is expensive. 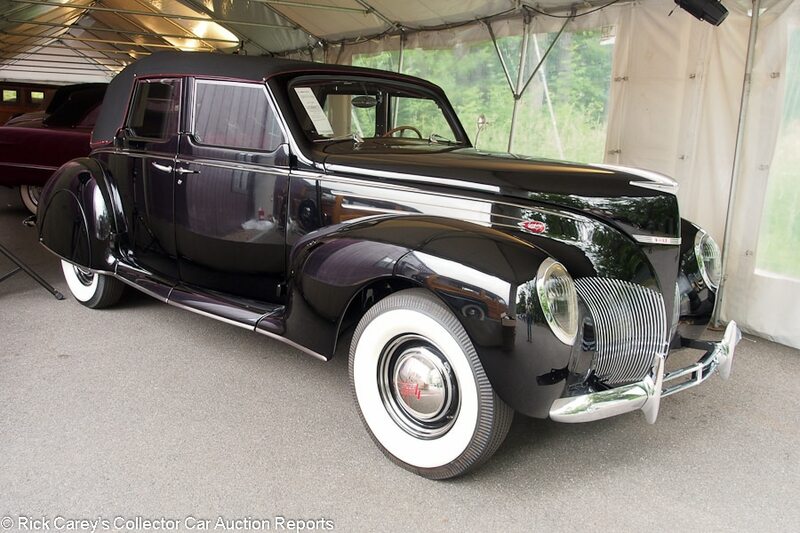 Lot # 931 1939 Lincoln-Zephyr Twelve Convertible Sedan; S/N H82138; Engine # 96H7422; Black/Red leather; Black cloth top; Estimate $190,000 – $220,000; Older restoration, 2+ condition; No Reserve; Hammered Sold at $101,786 plus commission of 12.00%; Final Price $114,000. 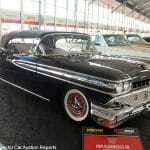 – Skirts, hubcaps and trim rings, Firestone wide whitewalls, Columbia 2-speed axle. 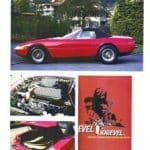 – Restored to concours condition for Mike Dingman without going too far and still show quality. The body style is handsome, sleek and distinctive. 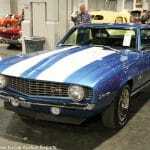 – Sold in the 2012 auction of Mike Dingman’s collection for $176,000 and a seriously great bargain here. This is far more car than the money it brought. 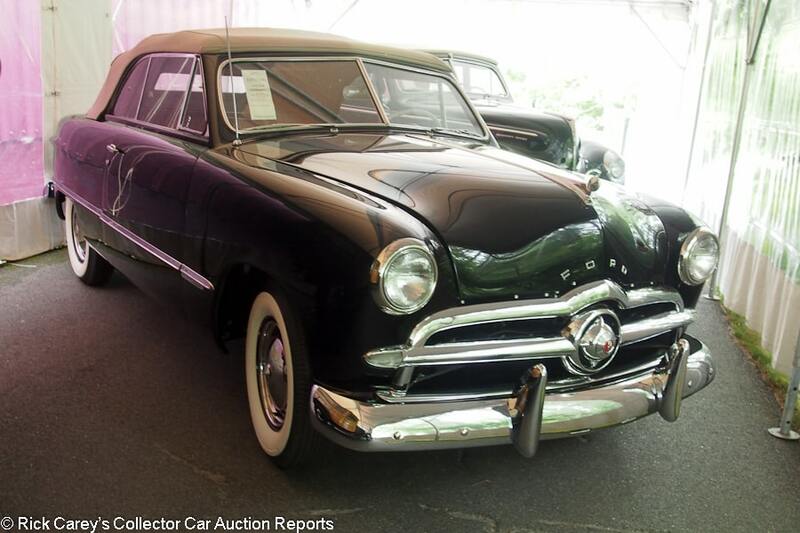 Lot # 912 1940 Mercury Model 09A DeLuxe Convertible Sedan; S/N 99A218781; Black/Saddle vinyl; Beige cloth top; Estimate $50,000 – $75,000; Not evaluated; No Reserve; Hammered Sold at $40,000 plus commission of 12.00%; Final Price $44,800. – Michael Dingman Collection. Lot # 941 1950 Mercury Model 0CM Club Coupe; S/N 0072H5064459; Black/Grey, Beige broadcloth; Estimate $40,000 – $60,000; Unrestored original, 2- condition; No Reserve; Hammered Sold at $80,000 plus commission of 12.00%; Final Price $89,600. – 3-speed, no radio (the radio frequency labels are on the clear panel but there’s no radio dial behind them), heater, dual Mercury remote spotlights, wide hubcaps and trim rings, wide whitewalls, ’51 Mercury fender skirts with a set of stock ’50 skirts included, Smithy’s glasspacks, lowered 2 inches. – 22,923 miles and all original. Very good original paint with some small flaws, scrapes and tiny edge chips. Clean original engine compartment and chassis. Even the cardboard trunk cards are pristine. The upholstery is flawless, as are the original floor mats and carpets. The chrome isn’t perfect but is more than good enough to be kept as is. The engine compartment is clean and orderly. Panel fits are like new. Early Ford V-8 Club Rouge Award for originality. Skeptical about the glistening paint? There’s a chip on the left front fender where the hood nicked it and there is no discernable evidence of earlier factory paint. Amazing. – This Merc was the surprise of the auction, a vehicle that is lucky to have escaped the attentions of would-be George Barrises. Its originality is eye-opening and so was the bidding on it which stalled early in the high 20’s, then took off between two determined bidders to this final result, double the low estimate. It is expensive, but there is not likely to be another one out there like it and it is just used enough to be driven sparingly with minimal effect upon its condition or value. The bidders’ judgment rules: this is ‘market’, at least for this original and well-preserved car. 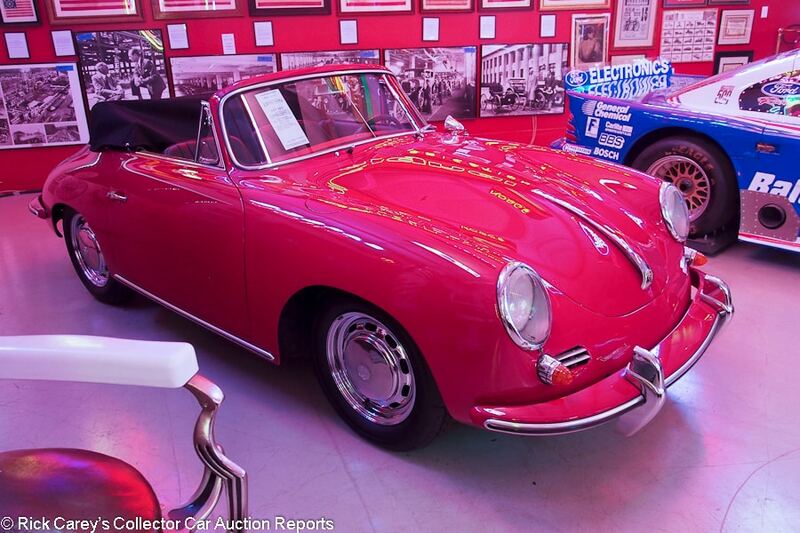 Lot # 923 1965 Porsche 356C 1600 C Cabriolet, Body by Reutter; S/N 161668; Engine # P716124; Red/Black leather; Black cloth top; Estimate $80,000 – $120,000; Modified restoration, 2- condition; No Reserve; Hammered Sold at $120,000 plus commission of 12.00%; Final Price $134,400. – Chrome wheels, Vredestein tires, Blaupunkt AM-FM, underdash Alpine CD stereo, VDO clock, Weber carbs, Warneford air filters, Porsche Kardex documented. – Replacement engine of the correct type with the original transmission. Excellent paint and chrome. Very good upholstery with lightly worn seats. Old undercoat in the wheel wells. Orderly but lightly oily engine compartment. A great driver with excellent cosmetics. Michael Dingman Collection. 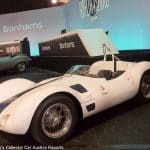 – This is, without a doubt, all the money for this replacement engine car showing miles and age, but it is a driver’s car, with plenty of driving enjoyment built in, the way a Porsche enthusiast would have prepared it sixty or seventy years ago. Even at that, though, its price is generous. 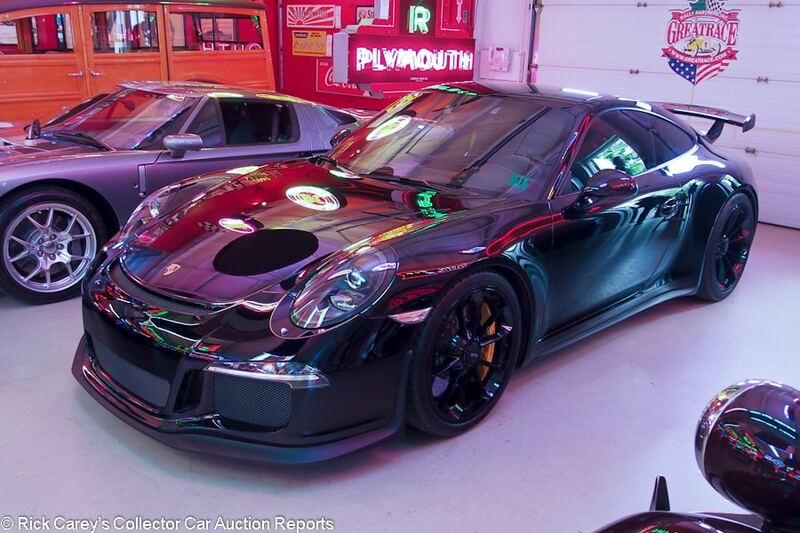 Lot # 925 2014 Porsche 911 GT3 Coupe; S/N WP0AC2A9XES183231; Black/Black leather, Grey Alcantara inserts; Estimate $130,000 – $160,000; Unrestored original, 2- condition; No Reserve; Hammered Sold at $120,000 plus commission of 12.00%; Final Price $134,400. – 3.8 liter, 475hp, Black centerlock wheels, Michelin Pilot Sport Cup 2 tires, stereo, navigation, heated seats, power windows, 7-speed PDK transmission, ceramic brakes, carbon fiber interior, 18-way sport seats and more. – Chipguarded nose and mirrors. 2,484 miles. Small dent over the passenger’s door. Nearly like new. Michael Dingman Collection. – Sold by Auctions America (now ‘RM Auctions’) from the Level Five liquidation sale at Auburn Spring in 2017 for $154,000 when it had under 900 miles, the 1,500 more it has added in the last 13 months (and the roof dent?) took a deserved whack at the value.